I’m one of those guys who doesn’t like to spend money on foods I can prepare at home if I don’t have to. Buying a desert even at Starbucks will run you dollars per slice like their popular Lemon Loaf. I’m no professional baker or pastry chef but there are some desserts that are fairly easy to make such as cakes, muffins, scones, cookies etc. The other day my wife noticed a Top Secret Starbucks Lemon Loaf recipe in her Facebook news-feed on Prego and Mommy Chat that made her drool. My lemon loaf today is inspired and adapted by this recipe as I made a few changes to create a different texture and full-flavoured lemon taste. 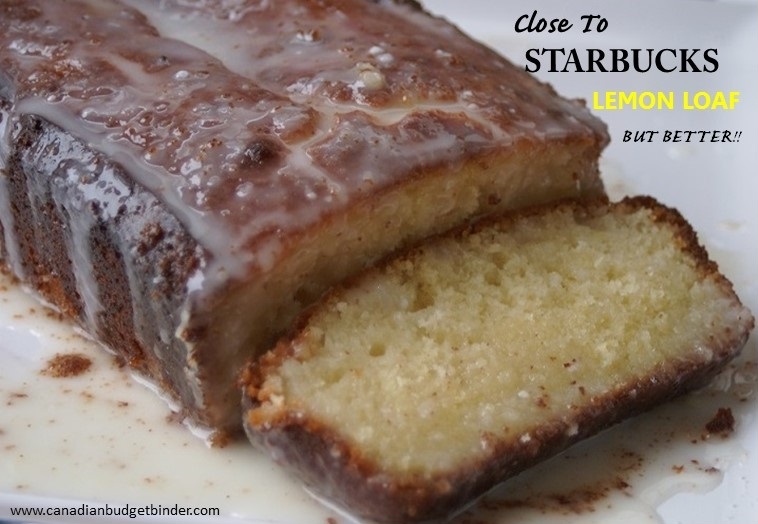 We’ve been to Starbucks many times (spending my allowance) and have seen the lemon loaf but have not tried it. The desserts served at Starbucks are premium and are very alluring when you are waiting in line for your coffee. I have to admit they have some pretty good coffee too. She whispered to me saying that there was another challenge on the table for me since my last was trying to copycat Twinkies. I thought they turned out pretty good. Just recently I tried my hand at creating my favourite Tim Horton’s muffin, the chocolate chip muffin. I thought I’d give the recipe my wife found a shot first to see what it was like. I agreed since I had all the ingredients in the pantry and it turned out as planned however we found it to be a bit dry and after 2 days it was clear this cake needed my special touch. This lemon loaf I’ve created is similar to a coffee cake or a pound cake in texture. Last week Nicola shared a UK favourite of mine Madeira cake which is traditionally made with a lemon or orange flavour and dusted with icing. What I found interesting about the Top Secret Starbucks Lemon Loaf recipe was that it used coconut oil which I though was something new I’d like to try. You will notice there is hardly any butter in the recipe and that’s why. One thing that stood out to me was it lacked the deep lemon flavour that I was craving. I expected more from the photo because it looked so good. Don’t get me wrong it was certainly a decent lemon loaf but I like more moisture and flavour. What I did was I created a lemon simple syrup which is dead easy to make on the stove-top. When the cake came out of the oven I poked holes all over the top and while it was hot I poured the lemon simple syrup all over the top of the lemon loaf. My idea was to create a moist lemon loaf with a lemon curd or lemon pudding like layer in the middle or near to the middle of the cake. Another favourite cake that I make is a cherry pound cake where I follow a similar procedure and is a hit at any function we bring it to. I also found that the icing on top of the original lemon loaf was too thick for my liking. I wanted to have a thin icing so I doubled the recipe an added a bit more lemon to make the icing thinner. You might think it’s quite a bit of icing but it’s not as it’s so thin. My version of this lemon loaf is definitely for the person with the sweet tooth. I poured the icing on top of the lemon loaf half way between being cooled completely and it still being warm. Since I doubled the icing I poured each cup on the lemon loaf in segments to let it soak in. I let the lemon loaf cool completely and I sat it wrapped in foil in our cold room or you can store in the refrigerator over night. We did manage to slice a piece of the lemon loaf to go with our cup of tea about 6 hours after it was baked. I can’t say that I’ve ever tasted a lemon loaf as delicious as this one. My wife can’t stop talking about how wonderful it turned out. She is a huge fan of Tim Horton’s sour cream Timbits so if you’re a fan she says the texture and icing of the lemon loaf is similar. I’ll definitely be making this lemon loaf again the next time we have company and I want to WOW them with a homemade dessert. This lemon loaf is inexpensive to make and tastes better than buying it from the bakery or grocery store. Overall I’m guessing it cost me under $5 to make and bake this lemon loaf which is home-run in my eyes considering you’d pay just that at Starbucks for one slice and a small coffee. This copycat Starbucks Lemon Loaf is so moist and has a lemon pudding like layer through the middle of the cake. You won't be disappointed if you are a lemon lover like I am. Lemon Icing ( I did this twice but if you only want to use it once go ahead but it won't be as good. Boil on high until reduced and like a syrup texture which takes about 10 minutes. Stir often. On the stove-top put the ingredients for the lemon simple syrup on the stove and get that going. Keep warm once it is done as you will be pouring it hot over the lemon loaf. Make the lemon icing by combining all the icing ingredients in a small bowl and mix with a whisk until smooth. Once the lemon loaf comes out from the oven poke hole with a large skewer all over the top of the loaf. Pour the entire lemon simple syrup mixture on top and then pour the glaze number 1 on top. Once that cools for 10 minutes add another recipe of glaze for a total of two glazing sessions. Let cool then remove from the loaf pan. Slice the lemon loaf when it has cooled but it's MUCH better the next day once the flavours come together. To get the best flavours of this lemon loaf I’ve created keep it in a cold room or refrigerator over night then slice the next day cold and serve. You can freeze this lemon loaf for months if you like but something tells me it won’t make the freezer it’s that delicious. Be warned that your hands will get sticky but you won’t hesitate to lick your fingers unless of course you plan to use a fork to eat it. Hopefully you all will give my version a try and see what you think. It’s just as drool-worthy… trust me I’ve eaten about 4 pieces of this lemon loaf alone. 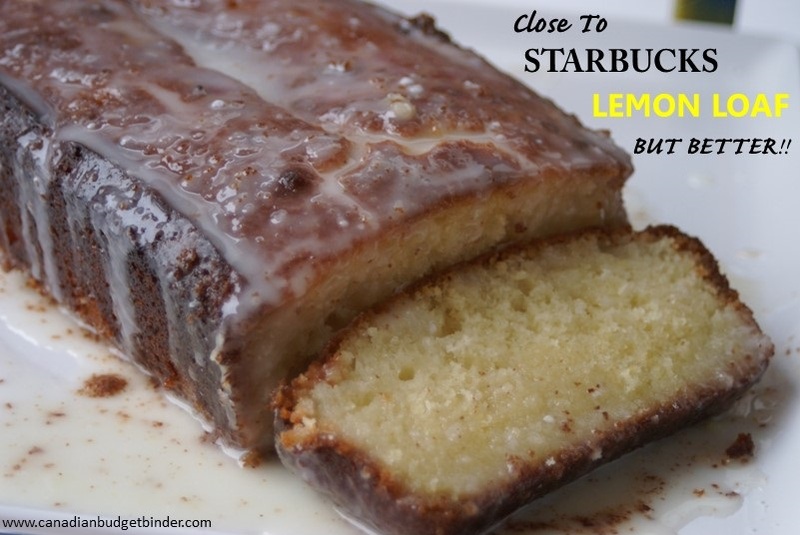 Have you found a keto version of this lemon Starbucks loaf? I haven’t done a lemon loaf with the drizzle poked through the cake however I do have a very popular Low Carb Dessert similar that you might like. It’s my LCHF Cream Cheese Lemon Pound Cake. Have a look, it’s so good!! Keep an eye out lots more Keto recipes on the way this year as we produce them in our CBB kitchen. I’m curious why you wait until the end to add the coconut oil? Intuitively I’d cream butter sugar and coconut oil, add the rest of the wet then the dry. Is there something I don’t know about coconut oil that makes that a bad idea? I just made this following your directions, but even though my coconut oil was pretty soft I think I ended up with some lumps in the batter. Anyway all this lemon smells delicious, I don’t know how we’re going to let it cool and set properly without sampling. You should be fine as it’s a fat and will melt. The original recipe as stated that I found on Facebook added the oil last and so that is what I did. The modifications I made to the recipe are what I stated in the recipe which is the addition of more lemon and the poking of holes to add the lemon simple syrup reduction to make a moist cake as I found the original to be a bit dry after the first day. I ate this cake 4 days in and it was still moist. You will find many cakes have a lumpy batter or even muffins and turn out fine. 🙂 Let me know how it goes and like I mentioned it was WAY better the next day once the glaze and syrup set. So good. I wish I had a slice right now! Yay! Mr CBB thanks for sharing this recipe. I have been wondering the recipe of every bread or cake Starbucks is selling. One recipe is revealed. I am so happy. I am gonna bake this lemon loaf this weekend. Where do you buy soft coconut oil? Is there a special brand you use? No no.. I just meant that when you scoop it out from the container that it’s soft or at room temp like your butter would be. I buy any coconut oil that it is on sale. Hope that helps Andrea.. just for the record I ate the last piece today 4 days after making it and it’s just as amazing. This does look yummy!! How did a loaf last 2 days at your place???? I’m lucky if a loaf makes it 24 hours!!! Have you tried Juanita’s recipe for lemon pound cake ?? I’ve made it a few times now and we love it!! It’s a nice delicate flavour and it makes 2 loaves. It’s cake like in texture. If I pick out a nice big lemon I only need the one. I think I’ll be making it for the next time we go to a family potluck at my SIL’s as she had a piece the first time I made it and loved it…. Mind you even 2 loaves do not last long here, not much over that 24 hour line!! I have some very hungry 2-legged rats around here…big ones too!! I’ve made a lemon loaf with a glaze before, I poke it with a piece of spaghetti so I can get right to the bottom. I usually make the glaze in a heat proof measuring cup and set it by the heat exhaust for the oven. On mine it’s against the control panel, some have an open burner that gets hot from the oven. I’m sure you can figure out what I am talking about. Just let it sit there in the heat giving it a stir now and again while the loaf is baking. Well there is only my wife and I as the boy doesn’t eat this stuff yet.. haha. I haven’t tried Juanita’s pound cake. Do you have her recipe handy? I’m sure you’d need to make a few pounds cakes to have them last at your house for at least the week. Boys love to eat don’t they!